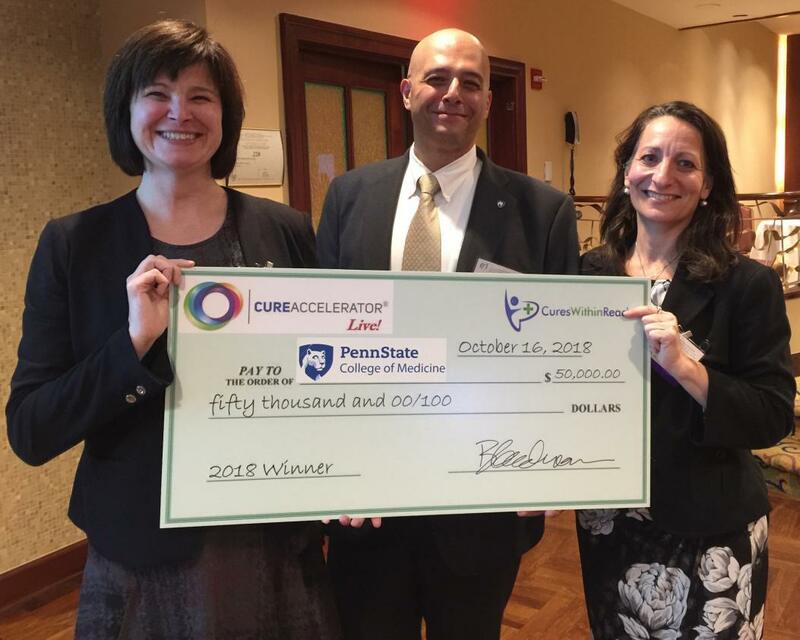 CHICAGO - Oct. 17, 2018 - PRLog -- Yesterday, John Elfar, MD representing Penn State College of Medicine won Cures Within Reach's 2018 CureAccelerator Live! philanthropic pitch event. CureAccelerator Live! brings together stakeholders from pharma, biotech, academia, medicine, philanthropy and patient groups to showcase repurposing projects in need of funding. Cures Within Reach is a leading global nonprofit focused on improving patient quality and length of life by leveraging the speed, safety and cost-effectiveness of medical repurposing research. Held in partnership with ExL's Collaborations Addressing Vulnerable Populations Forum in Herndon, Virginia, attendees voted for the winning repurposing clinical trial. The 2018 CureAccelerator Live! event focused on Mid-Atlantic region institutions with projects using repurposed therapies to treat an unmet medical need. "All the projects presented at CureAccelerator Live! have the potential to quickly create a positive impact for patients with unmet medical needs," said Clare Thibodeaux, PhD, Director of Scientific Affairs at Cures Within Reach. "We congratulate Dr. Elfar on his winning clinical trial, and recognize the outstanding work of the other finalists. The attendees truly had a difficult voting decision to make." Attendees heard from four clinician-researchers representing three academic medical centers in the Mid-Atlantic region. Dr. Elfar's project, "Repurposing a Drug to Answer the Golden Question in Severe Limb Trauma," will study the ability to diagnose severed vs. crushed nerves in patients suffering from limb trauma using a drug approved for multiple sclerosis patients. If successful, this approach could provide critical information significantly sooner to trauma surgeons treating these patients. Penn State College of Medicine and Dr. Elfar will receive up to $50,000 in funding from Cures Within Reach to support this research. "Repurposing research is an important strategy in quickly finding treatments for these patients at risk of losing the use of an arm or leg," stated CureAccelerator Live! winner Dr. Elfar, Penn State's Vice Chair for Research, Department of Orthopaedics and Rehabilitation and the Director, Center for Orthopaedic Research and Translational Science. "I am grateful to Cures Within Reach and its supporters for funding my work, and the work of other researchers like myself, which can make a real difference in patient lives through repurposing." · Akiva S. Cohen, PhD from the Children's Hospital of Philadelphia presenting "Repurposing a Dietary Therapy for Concussion"
· Adam Kaplin, MD, PhD from Johns Hopkins University presenting "Repurposing a High-Blood Pressure Drug to Decrease Pediatric Suicide"
· Mike Wang, ScM from Johns Hopkins University presenting "Repurposing an OTC Cough Medicine as a Rapid-Acting Antidepressant"
Cures Within Reach is grateful for its philanthropic supporters for the 2018 CureAccelerator Live! event, Goldman Philanthropic Partners and the Kahlert Foundation, as well as its other 2018 Global Partners: Horizon Pharma, the Knight Family, Medidata, Takeda Pharmaceuticals, TerSera Therapeutics and Vetter Pharma. For more information about CureAccelerator Live!, please visit https://cureswithinreach.org. CWR currently has a global portfolio of 18 repurposing research projects, as well as more than 180 repurposing research projects available for funding in a wide range of diseases on its CureAccelerator® site. Visit cureswithinreach.org or follow CWR via Twitter @CuresWReach, LinkedIn (LinkedIn.com/company/cures-within-reach), YouTube (YouTube.com/cureswithinreach) or Facebook (Facebook.com/CuresWithinReach).